That's right. There really is a plant called a spinach tree. 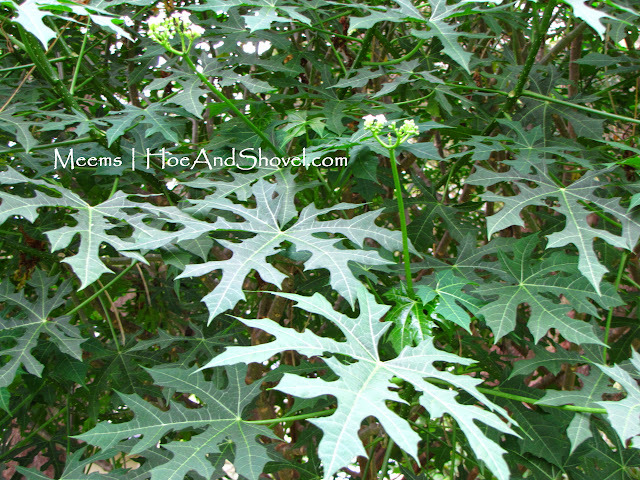 It is said that the leaves are edible, but MUST be cooked first to avoid toxins. I haven't been courageous enough (or maybe hungry enough) to try it, so I have no recommendations along those lines. I can recommend the spinach tree for other reasons though. Filler for the middle story in my garden is one great reason to love spinach tree. First, I'll supply a bit of back story about its origination in my garden. My spinach tree (Cnidoscolus aconitifolius) was grown from an 8" piece of branch I rooted. The small cutting was shared from a dear friend out of her very own garden. That small gift has turned out to be a surprise addition to the middle story. [The middle story is the space between the low-lying shrubs (the under-story) and the tall spreading canopy of tall oak trees.] I honestly had no idea the spinach tree would grow this large. It's sort of shading out a small Hawthorn tree in front of it and irises and Agapanthus underneath at this point, but I can move them if needed. Isn't the perfectly-shaped crown a wonder in itself? It reminds me of a beach umbrella. It has grown like this naturally. I don't shape or prune it. The whole of it fascinates me. 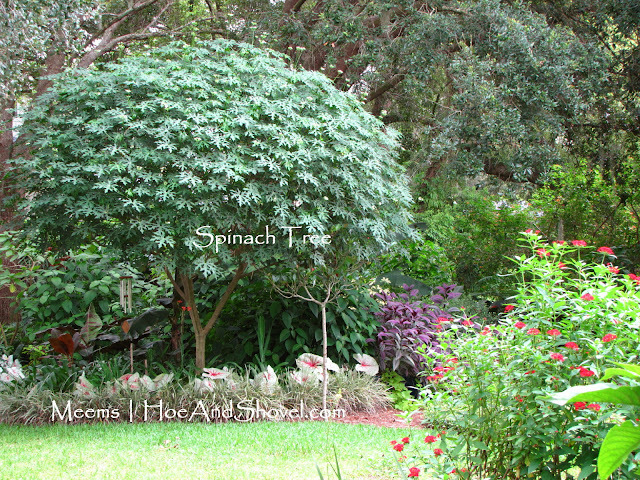 The multi-branching habit of the spinach tree supplies a haven for birds to find shelter. They use it as a stopping off point between the tall oaks and various dense shrubbery surrounding as they travel around through the garden. Birds are delightful characters to attract to the garden. The more varied plant life, the more wildlife will feel welcome and safe. Spinach tree is a member of the Euphorbia family. It is tender to frost or freezing conditions. Like so many great plants in Florida it loses its leaves and sustains damage, but returns quickly from established roots once spring returns. When drought conditions prevail, it requires no extra irrigation. Water conservation tops my priority list when deciding on suitable plants to put in the ground. 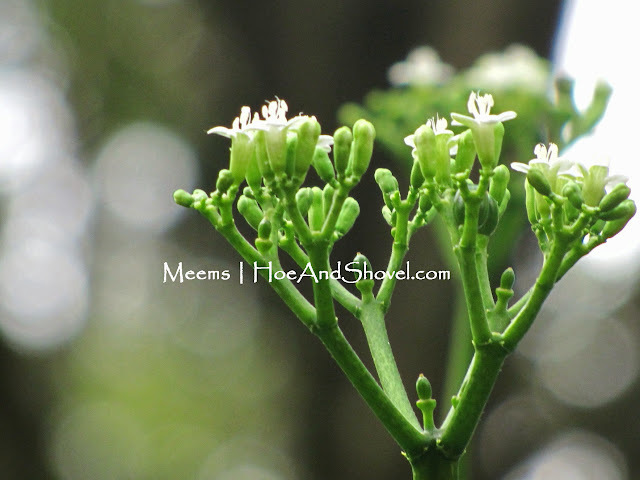 From the branches, small clusters of white flowers extend beyond the canopy on stiff stalks. The flowers blend into the background more than stand out as a focal point due to their insignificant size in comparison to the tree. The unique shape of the leaves is extraordinary enough to find room for at least one spinach tree in the garden. Apparently those small white flowers have more zing than my human eye detects. Butterflies of all varieties and small pollinators swarm the flowers that steadily bloom from spring through fall. That's what prompted me to plant two more (rooted cuttings from this tree) in the front garden. 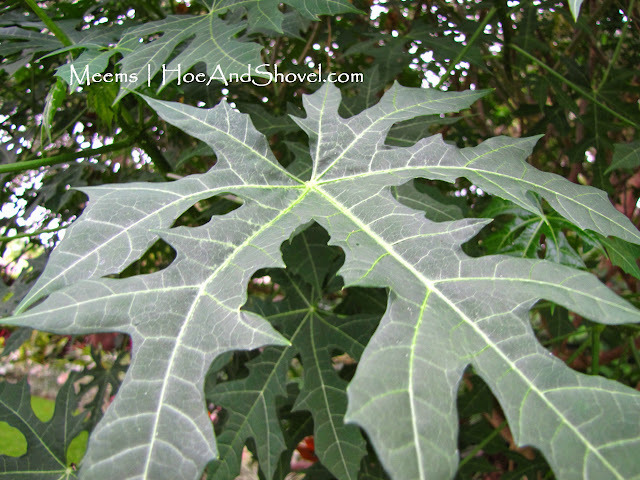 Whether you want to eat the leaves or admire them, I recommend this Florida-Friendly tree that delights wildlife and grows without fuss in filtered light conditions. You might have to start small like I did with a cutting from a gardening friend. I don't think I've ever seen spinach tree in a garden center. What a great little tree. I've never seen it at garden centers either. Another winner from your lovely gardens. What an amazing shape that tree is. Another Florida-friendly marvel. What a neat plant! I'd never heard of it before. 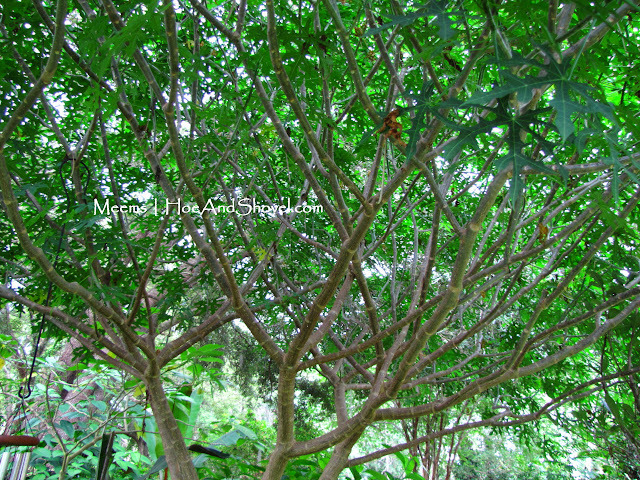 I love its perfect shape and interesting leaves. It looks so pretty the way you've placed it, with the caladiums growing below it. to cold, but has always come back. It is a great butterfly attractor. Love your pictures of this wonderful plant. I don't think I've encountered this tree yet. It's surprising you mentioned that you hadn't pruned it. I was looking at the picture right before and appreciating the tree top symmetry. You are right that it is amazing that it is a natural look. Wow! I like the shape of the spinach tree from afar. And you get to see many birds that perch there!